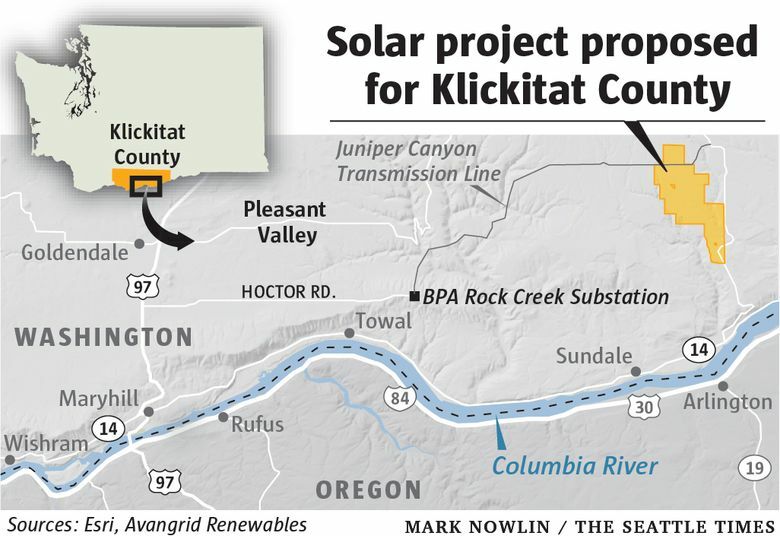 Puget Sound Energy (PSE) would buy the electricity produced from a solar farm proposed for Klickitat County, which has signed up 20 large customers who want renewable power. The Lund Hill solar farm, one of the most ambitious proposed for the Northwest, would consist of more than 500,000 panels set on leased private and state lands near Bickleton, according to Avangrid Renewables, the project’s Portland-based developer. Avangrid this month released details of the more than $100 million project and on Thursday disclosed that PSE plans to buy the power. To get a sense of scale, the solar farm — under review now by county officials — would produce enough electricity to serve 30,000 homes. But plans call for electricity to go to commercial and government customers who have signed for a “green direct” program that offers a blend of wind and solar power. Those customers include Amazon, Walmart, Sound Transit, the cities of Bellevue, Issaquah, Kent and Redmond, and six state agencies. PSE in 2017 generated nearly 60 percent of its power from natural-gas and coal-power plants. The private utility, which serves 1.1 million electric customers in 10 counties, is trying to reduce the carbon emissions release from its power production, and legislation under consideration by the state House and Senate calls for fossil-fuel power generation to be phased out by 2045.